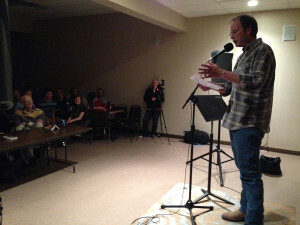 The Poetry Slam is a biannual poetry competition held to showcase individuals poetic creativity in a competitive format. 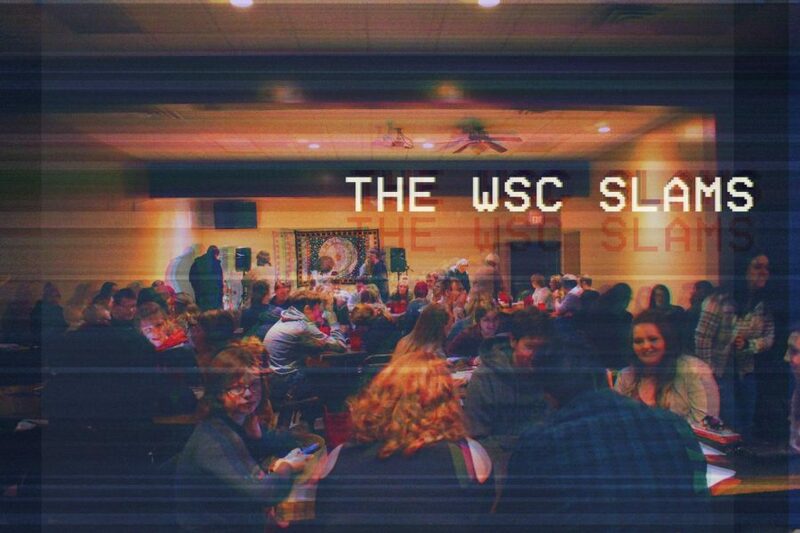 In the fall of 2018, Wayne State College celebrated its 40th consecutive poetry slam, making it the longest running poetry slam in Nebraska. The Lucky 13 Fiction Slam is also a biannual event which highlights regional writing specific to short storytelling. Entrants participate in a preliminary round from which the thirteen highest scoring competitors are chosen. The Slams are held at The Max Bar & Grill in downtown Wayne, Nebraska. Follow us on Facebook to find out more information on upcoming slams and to see pictures of past winners! When Lisa Sandlin came north from Santa Fe to join the English Department at Wayne State College, she brought with her the idea for a slam. She’d attended one, or knew someone who’d attended one, or had read a newspaper article about one—I don’t precisely recall—and that was enough to get us both excited. It seemed like something we ought to try. Only Lisa and I knew the competition was a sham. After a great show of gathering score sheets, tallying points and comparing notes, we would stand together and announce that “the winner is poetry!” That phrase was Lisa’s idea, too. I’m not sure why we didn’t play it as a straight competition. I suppose we had some notion that poetry shouldn’t be competitive. I know several poets who still “don’t believe in slams,” despite their obvious popularity. Maybe it was just too much fun to say the truth, that poetry was the winner. 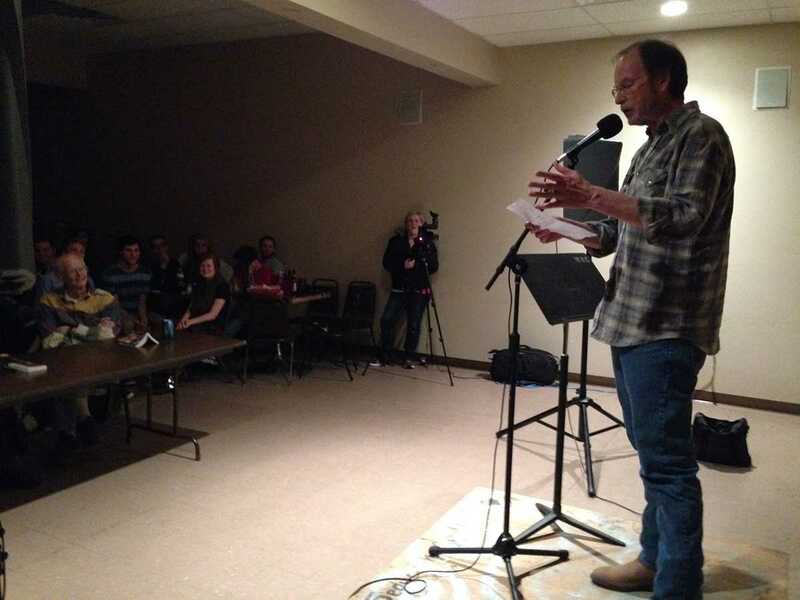 In most ways these “slams” weren’t much different than the public readings many workshop teachers host for their students. I had done that for years. But a significant difference became obvious: the quality of the performances. Not only did these young poets slam with a kind of fire I had never heard in workshop readings, the performances gained dramatic power as the evening went on. Clearly, competition added an edge to the work, and, even more obviously, poets fed off each other, determined to outperform the poets who’d read before them. The result was an evening of poetry that built as it went on. At this writing, Slam XIII is about a month away. 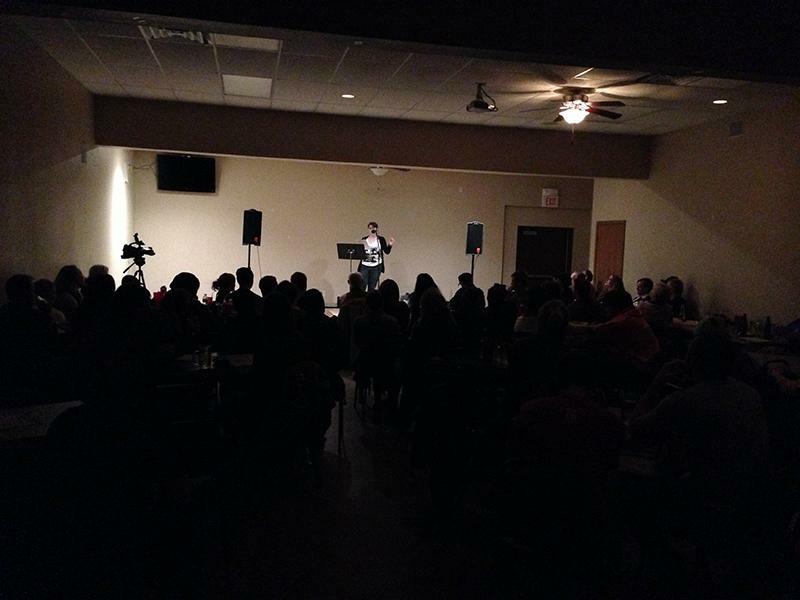 Wayne State hosts two slams a year, one each semester. My shaky calculations suggest, then, that the first downtown slam was in the spring of 1999, a fitting end to the old millennium and a nice kickoff to the new. That first slam was more successful than I could have imagined—packed house (including a good number of drunks), an awful lot of good poems and performances, close judging and a suspenseful finale. The downtown slams continue to be the highlights of the year for me. Though lots of folks from out of town have competed and sometimes won, the core competitors continue to be Wayne State undergraduates. I’ve seen them hold their own against some very seasoned slammers, and that is an invaluable part of a literary education these days. What was, and continues to be, best in the slams are the surprises, when very young poets I’ve known only in a workshop appear to visibly grow in the spotlight, finding their voice to speak their piece to an attentive crowd. That moment, when an unprepossessing student morphs into a poet capable of dictating when the audience breathes, is magical. And magic is what poetry is about. Magic can and does happen on the page, but the connection slams allow between poet and audience is both larger and more personal than the printed word. And it’s reassuring, in a new century and millennium, to see that most ancient of the literary arts—poetry—return to its oral roots. When it comes to slams, Lisa has always been right: Poetry is the winner.